Founded in 1824, and known as Ecore Fabre for its first 20 years, Camden emerged as an economic center of southern Arkansas in the mid-19th century. For over 50 years, a small but successful Jewish community thrived in this town on the banks of the Ouachita River about 100 miles south of Little Rock. The Ouachita flows into the Mississippi, and so the smaller river became a key conduit for Arkansas farmers and traders to reach the regional market in New Orleans. Camden became a cotton trading depot for ten rural counties. In 1860, Camden was the second largest town in Arkansas, with 2,219 residents, behind only Little Rock. The Jewish community of Camden grew with its economic fortunes. Though its Jewish population was never large, Camden was home to several prominent Jewish families that played a remarkable role in the town’s development. Jews began to arrive in Camden the 1840s. By the time of the Civil War, at least 24 Jewish men lived in Camden, several of whom had families. Although virtually all of them were foreign-born and had not lived in the South for very long, many Camden Jews took up arms for the Confederate cause. Perhaps most notable was David Felsenthal, who came to the United States in 1851 at the age of 18. When the war broke out, Felsenthal closed his mercantile business at great cost and joined the Confederate army. He was captured during the war by the Union Army. His older brother Bernard was a prominent reform rabbi in Chicago, and was able to intercede with the federal government and get David released. Upon his release, David returned to Camden. After the war, the Jewish population of Camden grew, reaching a peak of 86 Jews in 1878. By 1870, they had formed a Hebrew Benevolent Society and purchased land for a cemetery. In December of 1870, 24 men formed a congregation called Beth El Emeth (House of God of Truth). Two years later, they constructed Camden’s first synagogue. Many of these immigrants from the German states and Alsace arrived as peddlers and opened retail stores. The economic success of 19th century Camden Jews is quite impressive. Of the 14 members of the Hebrew Benevolent Society in 1870, 11 were merchants; together they owned $56,500 in real estate and $97,700 in personal property. Henry Myar arrived in Camden in 1858 with little money but great ambition for an 18-year-old. After fighting in the Civil War, he returned to Camden and became a successful merchant and cotton buyer. He acquired 20,000 acres of land, raising cotton on a large portion of it. To facilitate his trade with New Orleans, he built a steamship he named “City of Camden” in 1896. The boat was active for ten years. Myar also helped to establish Camden National Bank. By the time he moved to Little Rock in 1915, Henry Myar was the wealthiest man in Camden. Nathan and Louis Bry opened Bry and Brothers Dry Goods Company, which was considered the first modern department store in the southern Arkansas. The store marked many firsts in the area: it was the first strictly cash store in town, the first to have one plainly marked price for merchandise, the first to offer a money-back guarantee, the first to use pennies in pricing, and the first to hire female clerks. The Bry brothers rose from modest beginnings to become very successful. They eventually moved to St. Louis and opened a ladies’ clothing manufacturing company. 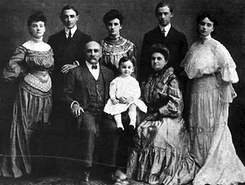 Unlike other successful Jewish businessmen who left Camden for bigger cities, the Berg family lived in town for over 130 years. 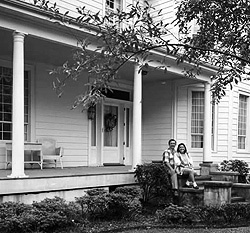 Meyer Berg first arrived in 1856 with his wife Gette; they soon opened M. Berg Mercantile. Their sons, Leo and Henry, joined the family business, changing its name to Berg Brothers Dry Goods once their father died. Leo and Henry got involved in several other businesses, including a jewelry store and a mortuary. Both were very involved in local banks. Leo Berg was president of Merchants and Planters Bank for several years; Henry was president of the First National Bank of Camden. For a while, both presidents of the only two banks in town were the sons of Meyer Berg. From his role as a business leader, Leo also became involved in local politics. He served as a ward alderman for several terms, and was elected mayor in the 1920s. Already a successful businessman, Berg donated all of his salary as mayor to local charities. Leo’s son Mike was also a prominent business and civic leader in Camden. Leo Berg was just one of several Camden Jews who served in public office. The tradition goes all the way back to Solomon Block, one of the earliest Jewish settlers in Camden and the first president of the local congregation. As head of the local school board, Block fought off attempts to require bible reading in the public schools. When supporters amended the proposal to require that only the Old Testament be read, Block remained steadfast against it, believing that religious instruction had no place in the public schools. Block was a successful businessman, owning a large mercantile firm with his partner Edward Feibelman. The two later purchased a 1,900 acre sugar plantation on Bayou Teche on Louisiana, which Block managed. Block had married Mary Levinson of Washington, Arkansas, which shows that Jewish immigrants were able to find Jewish spouses even in 19th century Arkansas. 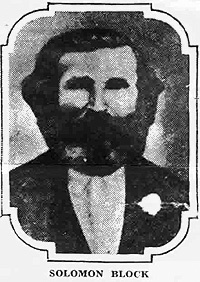 Solomon Block died in 1886. Jacob Freidheim ran away as a teenager to join the Confederate Army. His experience fighting the Union did not prevent him from becoming a leader in the Republican Party after the war. He once ran unsuccessfully against the incumbent Democratic congressman as the Republican nominee for the U.S House of Representatives. A prominent local lawyer, Freidheim served on the local school board and was appointed registrar at the Federal Land Office in Camden. Freidheim was a major booster of local industrial development, working to attract Northern investors to Camden. He helped bring coal mining to the area. Several other Camden Jews were civic leaders. Moses Stern was elected to the city council and served as president of the local Board of Trade. His son Leonard was both an alderman and a well respected municipal judge. Joseph Levy also served on the city council. Adolph Felsenthal, the son of David, was Ouachita County Assessor and was credited with getting federal support for a series of dams and locks on the Ouachita River. Abe Lazarus ran a very successful wholesale grocery business that had several branches throughout Arkansas and Louisiana. He took his first name to heart, and reportedly looked and dressed like Abraham Lincoln, a quality that might have been somewhat controversial in the former Confederacy. Nevertheless, Lazarus was put forward as a candidate for school board without his knowledge and was elected. He served as its president for twelve years. Camden Jews were also active in many local fraternal societies, including the Knights of Pythias, Masons, and Odd Fellows. This record of civic involvement and political success suggests that anti-Semitism was not a significant force in Camden. Indeed, Camden Jews enjoyed close social and business relationships with local Gentiles. Looking back at his life as a Jew in Camden, Adolph Felsenthal wrote in 1934, “always from the years before the Civil War, there was a preponderant spirit of friendliness…tolerance, and good will.” In the 1920s, the Ku Klux Klan grew powerful in Arkansas, as in much of the rest of the country. To thwart local Klan-backed political candidates, Camden Protestants organized an unofficial primary before the actual Democratic primary so all anti-Klan voters could unite behind one candidate. This strategy was successful in keeping the Klan out of power in Camden. Indeed, Leo Berg was the town’s mayor during the peak years of the Klan. The Jewish community of Camden peaked during the late 19th and early 20th centuries. A few Jewish immigrants from Eastern Europe arrived in the early 20th century, but these additions were not enough to replenish the declining Jewish community. Frank Phillips was one of these immigrants, arriving from Russia in 1903 and opening a dry goods store after spending time as a peddler. The Great Depression took a serious toll on his business, and he closed it and moved to Memphis. In 1937, 60 Jews still lived in Camden, and the numbers soon went into steep decline. In 1927, they had sold their synagogue with hopes of building a new one, but this never came to pass as the congregation’s membership continued to drop. In the late 1930s, Henry Berg built a small synagogue, but it was not used regularly. The warm welcome Jews received in Camden could be both a blessing and a challenge. Alfred Rose grew up in Camden and came back after college to be editor of the local newspaper. He married a local Gentile and converted to Christianity in 1947. By the 1990s, only one Jewish family remained in Camden, long after the congregation dissolved. Today, the Jewish cemetery remains the only visible vestige of what was once a small but prominent Jewish community.